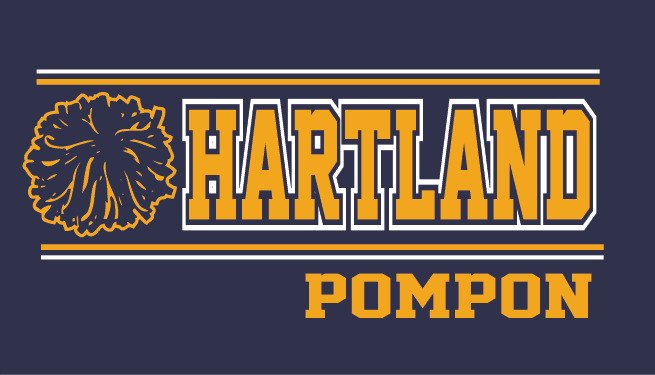 HARTLAND POM APPAREL and ACCESSORES are now available to order online! IMPORTANT - ORDER DEADLINE IS FRIDAY, DECEMBER 28th. No orders will be taken after the December 28th deadline. FOR "HARTLAND POM" MERCHANDISE - YOU HAVE THE OPTION FOR A "REGULAR" PRINT OR A "GLITTER" PRINT. PLEASE SELECT THE OPTION YOU WOULD LIKE CAREFULLY. ALL "FAN GEAR" IS REGULAR PRINT. PLEASE BE CAREFUL TO SELECT THE BACK LOGO "POM" OR "VARSITY" THAT YOU WOULD LIKE. You may CUSTOMIZE any of the shirts with name at an additional charge. To customize, make selection on the page of the item you are ordering. Please be sure to indicate the correct spelling of the name. DELIVERY - ALL ORDERS WILL BE DELIVERED TO YOUR POMMER AT PRACTICE.